2.1.2 Risk assessment …………………………………………………… Error! Bookmark not defined. 2.1.3 Monitoring and controlling the credit risk ……………….. Error! Bookmark not defined. 2.2 Credit risk management ………………………………………………. Error! Bookmark not defined. 2.2.1 Credit scoring ………………………………………………………. Error! Bookmark not defined. 2.2.2 Credit ratings ……………………………………………………….. Error! Bookmark not defined. 2.2.3 Credit risk management ………………………………………… Error! Bookmark not defined. 2.3 Basel II/III …………………………………………………………………. Error! Bookmark not defined. 2.4 Literature review ………………………………………………………… Error! Bookmark not defined. 3.2 Regulatory framework for the credit risk management in Macedonian banking sector………………………………………………………………………………………. Error! Bookmark not defined. 3.3 Credit portfolio of Macedonian banks for the period 2007-2015Error! Bookmark not defined. 3.3.1 Credit risk according to the bank’s size …………………… Error! Bookmark not defined. CHAPTER 4 – Conclusion ……………………………………………………. Error! Bookmark not defined. References ………………………………………………………………………….. Error! Bookmark not defined. APPENDIX ………………………………………………………………………… Error! Bookmark not defined. Table 1 Classification of operational risk event types ………………. Error! Bookmark not defined. Table 2 Selected indicators of foreign banks that have subsidiaries in Macedonia, as of 31 December 2014 in percentages, except credit rating ………………… Error! Bookmark not defined. Table 3 Annual total credit exposure (in millions of denars) …….. Error! Bookmark not defined. Table 4 (C, D and E) / Total credit exposure in % …………………… Error! Bookmark not defined. Table 5 E / Total credit exposure in % …………………………………… Error! Bookmark not defined. Table 6 Net C, D and E of impairment losses / Own funds in % .. Error! Bookmark not defined. Table 7 E / Own funds in % ………………………………………………….. Error! Bookmark not defined. Table 8 Nonperforming loans / Total loans (only nonfinancial entities are included) in % .. Error! Bookmark not defined. Table 9 Calculated impairment losses and special reserves / Own funds in %Error! Bookmark not defined. Table 10 Annual capital adequacy ratio in % ………………………….. Error! Bookmark not defined. Table 11 Annual return on average equity ………………………………. Error! Bookmark not defined. Figure 1 Types of risks ………………………………………………………… Error! Bookmark not defined. Figure 2 Steps in risk management process …………………………….. Error! Bookmark not defined. Figure 3 Generic architecture of a PD rating system ………………… Error! Bookmark not defined. Figure 4 Pillar 1 anatomy ……………………………………………………… Error! Bookmark not defined. Figure 5 Basel III implementation …………………………………………. Error! Bookmark not defined. Figure 6 Liquidity coverage ratio ………………………………………….. Error! Bookmark not defined. Figure 7 Net stable funding ratio …………………………………………… Error! Bookmark not defined. Figure 10 Annual growth of credit exposure, by sector in % …….. Error! Bookmark not defined. Figure 11 Annual share of the uncollateralized exposure in the total credit exposure to non-financial entities and to individual sectors in % ………………………. Error! Bookmark not defined. Figure 12 Annual materialization of credit risk in banks’ credit portfolios in millions of Denars and in percentage ………………………………………………………………… Error! Bookmark not defined. Figure 13 Annual share of large exposures to non-financial entities in banks’ own funds in %………………………………………………………………………………………….. Error! Bookmark not defined. Figure 14 Annual share of non-performing loans to total loans of non-financial entities and by sectors in % ………………………………………………………………………… Error! Bookmark not defined. Figure 15 Annual coverage of non-performing loans and share of net non-performing loans in banks’ own funds in % …………………………………………………………. Error! Bookmark not defined. Figure 16 Annual capital adequacy ratio ………………………………… Error! Bookmark not defined. Figure 17 Annual total credit exposure of Macedonian banks, by banks size, 2007-2015 … Error! Bookmark not defined. Figure 18 Annual participation of C, D and E categories in total credit risk exposure of Macedonian banks, by banks size, 2007-2015…………………………. Error! Bookmark not defined. Figure 19 Annual participation of E category in total credit risk exposure of Macedonian banks, by banks size, 2007-2015 ……………………………………………………… Error! Bookmark not defined. Figure 20 Annual participation of Net C, D and E of impairment losses in own funds by banks size, 2007-2015 …………………………………………………………………… Error! Bookmark not defined. Figure 21 Annual participation of E in own funds, by banks size, 2007-2015Error! Bookmark not defined. Figure 22 Annual participation of nonperforming loans in total loans, by banks size, 2007-2015………………………………………………………………………………………….. Error! Bookmark not defined. Figure 23 Annual participation of impairment losses and special reserves in own funds, by banks size, 2007-2015 …………………………………………………………………… Error! Bookmark not defined. Figure 24 Annual capital adequacy ratio in %, by banks size, 2007-2015Error! Bookmark not defined. Figure 25 Annual return on average equity, by banks size, 2007-2015Error! Bookmark not defined. Figure 26 Trends of annual credit exposure, NPL/total loans and CAR for large banks, 2007-2015…………………………………………………………………………………… Error! Bookmark not defined. Figure 27 Trends of annual credit exposure, NPL/total loans and CAR for medium-sized banks, 2007-2015 ………………………………………………………………………….. Error! Bookmark not defined. Figure 28 Trends of annual credit exposure, NPL/total loans and CAR for small-sized banks, 2007-2015 ………………………………………………………………………….. Error! Bookmark not defined. Credit risk is the oldest and biggest risk that bank, by virtue of its business nature inherits. This study first identifies the importance of Credit Risk Management for commercial banks and then tries to find out the existing procedures for credit risk management that are followed by the different commercial banks in Macedonia. The credit risk portfolios of the banks in Macedonia are investigated according to the bank’s size – according to the banks’ classification in three groups – large, medium and small. The future of banking will undoubtedly rest on risk management dynamics. Only those banks that have efficient risk management system will survive in the market in the long run. The effective management of credit risk is a critical component of comprehensive risk management essential for long-term success of a banking institution. This thesis is concluded with some guidelines that will help commercial banks to sustain in the volatile market, especially focusing on the banks’ size in the context of credit risk management. Credit extension is critical to banks operations, measuring significantly within the asset of the balance sheet. It has the capability of creating huge profit, and just as high risk. Research studies demonstrate that credit risks are the most highly registered in time by banks, regarding losses. Credit risk is an investor’s risk of loss arising from a borrower who does not make payment as promised (Bluhn, et.al. 2002). Loans that constitute a large proportion of the assets in most banks’ portfolios are relatively illiquid and exhibit the highest credit risk (Koch and MacDonald, 2000). The management of credit risk in banking industry takes after the procedure of risk identification, estimation, evaluation, monitoring, and control. It includes identification of potential risk elements, estimate their consequences, monitor activities related to identified risk factors and integrate control measures to avoid or decrease the undesirable impacts. This procedure is applied within the strategic and operational management of the bank. and in the extension of commitments and guarantees, and the settlement of transactions. The objective of risk management is to reduce the impacts of various types of risks identified to a preselected domain to the level accepted by rules and standards. It may refer to various sorts of risks brought on by environment, innovation, individuals, associations and governmental issues. Goodhart (1998) states that poor credit risk management which results in undue credit risk causes bank failure. Chimerine (1998) concurs with Goodhart. This results in insolvency of banks and reduces funds available for new investments, which eventually leads to bank failure. Goodhart et al (1998) connected lending to the causes of bank failure. Irregular meetings of loan committees, false loans, large treasury losses, money laundering in large amounts, contribute to bank failure. The ability of banks to quantify credit risk obviously has the potential to greatly improve risk management capacities. With the estimated credit loss, the bank can choose how best to deal with the credit risk in a portfolio, for example, by putting aside the suitable loan loss reserves or by selling loans to reduce risk. Andersen, J. et al., (2003) explain that to a greater degree the use of credit risk models will enable the banks to undertake portfolio management, which takes due account of the varying impact of business cycles on lending. It is imperative to note, however, that in the process of banks to make a choice to grant credit they will keep on relying upon an assessment of the actual risk with an exposure details. Effective system that ensures repayment of loans by borrowers is critical in dealing with asymmetric information problems and in reducing the level of loan losses, thus the long term success of any banking organization (Basel, 1999; IAIS, 2003). Effective credit risk management involves establishing an appropriate credit risk environment; operating under a sound credit granting process; maintaining an appropriate credit administration that involves monitoring process as well as adequate controls over credit risk (Basel, 1999; Greuning and Bratanovic, 2003; IAIS, 2003). It requires top management to ensure that there are proper and clear guidelines in managing credit risk, i.e. all guidelines are properly communicated throughout the organization; and that everybody involved in credit risk management (CRM) understand them. collected. (Basel, 1999; Greuning and Bratanovic, 2003; PriceWaterhouse, 1994). Screening borrowers is an activity that has widely been recommended by, among others, Derban et al (2005). This suggestion has been widely put to use in the banking sector as credit evaluation. According to the information theory, an accumulation of reliable information from forthcoming borrowers becomes critical in achieving successful screening. Considering the importance and the role of managing risks in the modern banking systems, the aim of this research is to gain better understanding of risk management procedures. Banks face different elements of risk and they should be properly identified, understood, measured and managed. In addition to the overview of the basic concepts of banking risks, the thesis will focus on credit risk management, the methods used by banks for efficient credit risk management, and analysis of the action they take to control credit risk. Credit risk is the most obvious risk of a bank by the nature of its activity. In terms of potential losses, it is typically the largest type of risk. A separate analysis will be made for the banking system in Macedonia. A research will be done on how domestic banks deal with credit risk, with particular reference to the credit portfolio of Macedonian banks (large, medium and small size banks) during the period 2007 – 2014. Given the complexity of the research topic, a theoretical elaboration will be given on different aspects of credit risk management. For the purpose of this research extant literature related to the topic from different databases, websites and other available sources was collected. A systematic review of collected literature was done in detail. A literature review using an archival method is adopted as it enables us to structure research and to build a reliable knowledge base in this field. The research will include analysis of the credit risk evaluation and credit risk indicators in Macedonian banks. The review will include banks classified according to the size – the group of large, medium and small banks in Macedonia. In the research of the subject matter scientific methods employed in social sciences will be applied. Besides the theoretical studies, the analytical, statistical and comparative method will be used. During the writing of the thesis, also, other methodological procedures will be involved, resulting both in theoretical and practical knowledge. Conclusions should be drawn using inductive and deductive methods. The paper has the following structure: Chapter 2 presents a theoretical elaboration on the main problem areas of the thesis. This section provides a review on risk management and procedures related to credit risk in banks. Additionally, an overview of Basel II/III regulations is given, as well as an overview of the empirical literature regarding the banks’ size and credit risk. Chapter 3 considers the credit risk management in the Macedonian banking sector. First, the banking system of Macedonia is analyzed. Then, an analysis of the regulatory framework for the credit risk management in Macedonian banking sector follows. Lastly, the thesis provides a research on credit risk portfolio of the banks for the period 2007-2015, with particular reference to the differences due to banks’ size. The last chapter gives concluding remarks about the results and presents future recommendations. The objective of this paper is to establish the theoretical background of the topic treated within the thesis and provide a review of the empirical literature. The first part of this chapter deals with the basic concepts of risk management. The purpose of this part is to define risk and risk management, to provide guidelines on risk assessment procedures and to establish a framework for evaluation and controlling risks. The second part provides a more detailed analysis on credit risk management. This chapter explains the procedures of credit scoring and credit ratings and presents the basic concepts on credit risk management. The last part reviews the Basel II/III Accords. It is undeniable that the risks faced by banks have increased in recent years. Financial markets have become more volatile and this has exposed the banks to greater fluctuations to interest rates and exchange rates. The process of deregulation in many countries has bitten into banks’ traditional sources of income, thus both encouraging and permitting them to diversify into other types of business activity, including property trading in securities, foreign exchange and new products. These developments have increased the pressure on management to control their risks in a more proactive manner.  Risk is an undesirable situation or circumstance that has both a likelihood of occurring and a potential negative consequence on the project (ESA/ESTEC, ECSS standard, 2000). The banking system of Republic of Macedonia consists of financial institutions and legal rules (regulations) through which the banking activities in Macedonia are conducted and regulated. The banking system is part of the overall financial system in Macedonia. It consists of the National Bank of Macedonia, commercial banks, savings houses and deposit insurance fund, and laws and regulations regarding the banking activities. Macedonia inherited the banking system of former Yugoslavia, owned by the state and with a structure which matched the former planned economy. The monetary independence of Macedonia was in line with the adoption of legislation in the field of monetary policy and foreign exchange policy of 26 April 1992. That act laid the foundations of the banking system in Macedonia. However, restructuring of the Macedonian banking system started relatively late, in 1995, through the write-off of old foreign currency savings, claims and liabilities in terms of foreign loans and rehabilitation of the largest Macedonian bank – Stopanska Banka – Skopje (Nikolovska, 2009).  Safety and protection of savings. The main objective of these principles was to create a healthy banking system, as a precondition for gaining the trust of the citizens. 23. other financial services specified by law allowed to be performed exclusively by a bank. In order to increase the competition between banks, at the beginning of the transition period the barriers for entering the banking sector were reduced through the installation of more liberal legislation for establishing banks. That resulted in increase in the number of banks, from 5 banks to 20 banks, 1 branch of a foreign bank and 17 savings banks. 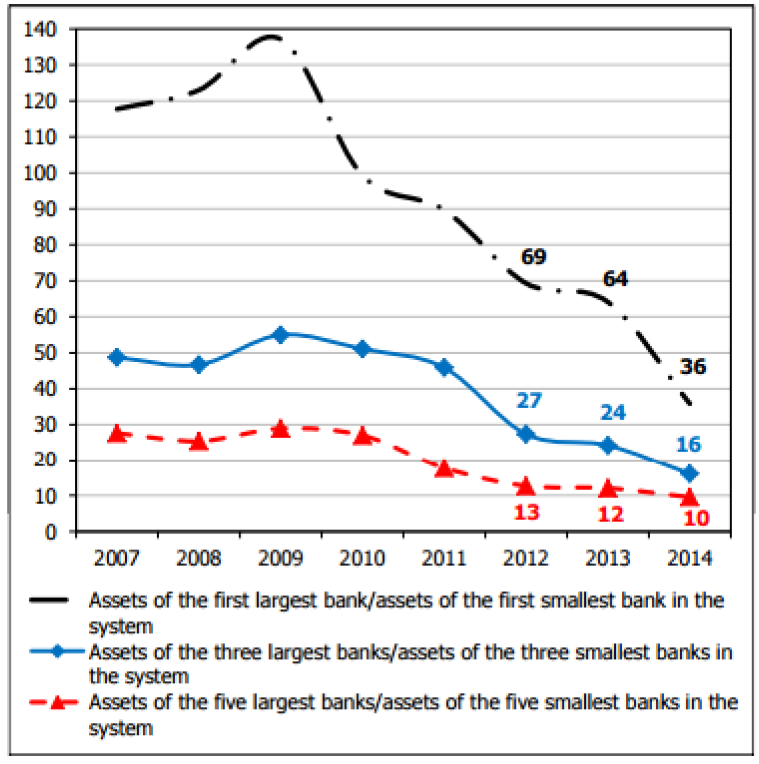 The trend of increasing the number of banks and savings banks in the first years of the transition, was combined with the process of consolidation of the banking system (Trpeski, 2003). development bank that aims to support and stimulate the development of the Macedonian economy in line with the strategic policies, objectives and priorities of Macedonia (Law on the Macedonian Bank for Development Promotion). It is a joint stock company in which the Republic of Macedonia is the only shareholder. The Deposit Insurance Fund has an important role of supporting the banking system, increasing the savings and encouraging investments. With the guarantee of household deposits in the commercial banks and savings banks, the citizens regain confidence in the banking sector after the bad experiences with the frozen deposits in the old system. In 2015, the banking system of Macedonia was composed of fifteen banks and four savings banks. The banking network in 2015 consisted of 427 business units spread across almost all the cities in the country. Compared with the previous year, this number decreased by two business units. Most business units are concentrated in the Skopje region. Compared with other regions, this region still offers the best access to banking services, measured by the number of residents per business unit (NBRM, 2016). Large banks are: Komercijalna Banka AD Skopje, Stopanska Banka AD Skopje, NLB Tutunska Banka AD Skopje, Ohridska Banka AD Ohrid. Medium-sized banks are: Macedonian Bank for Development Promotion AD Skopje, ProCredit Banka AD Skopje, Stopanska Banka AD Bitola, TTK Banka AD Skopje, Universal Investment Bank AD Skopje, Halk Banka AD Skopje, Sparkasse Banka Makedonija AD Skopje. Small banks include: Alpha Banka AD Skopje, Eurostandard Banka AD Skopje, Kapital Banka AD and Central Cooperative Bank AD Skopje.  The participation of the group of small banks amounted to 3.6%. At the end of 2015, the three largest banks in Macedonia occupied almost two thirds of the total assets of the banking system, where the largest bank had a share of 22.9%, while the share of the smallest bank accounted for 0.7% of total assets of the banking system of Macedonia (NBRM, 2014). In 2015, in the total loans to non-financial entities, large banks participated with 70.1%, medium-sized banks with 26.4% and small banks with 3.5%. Also, the concentration is expressed as measured by the share in total deposits of non-financial entities, where the large banks participated with 73.7%, medium-sized banks had a share of 22.7% and small banks had a share of only 3.6%. Data on concentration under capital and reserves were again in favor of big banks, which had a share of 64.2%, the medium-sized banks participated with 31.4% and small banks had a share of only 4.3% of the total capital of the banking system. 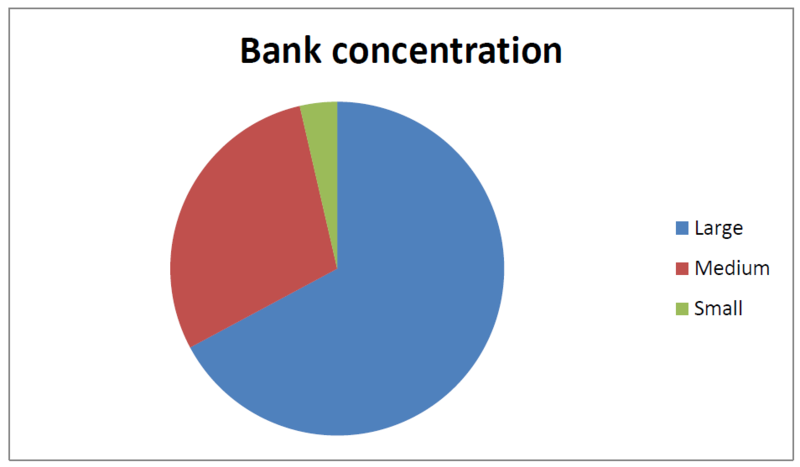 Concentration in the banking system is relatively high, although there is a continuous downward trend. Due to high concentration there are several systemically important banks, whose performances play a crucial role for the overall banking system and domestic economy. In 2014, one bank was acquired by another (third acquisition in the last seven years), which coupled with the accelerating growth of the activities of the smaller banks in the system reduced, to some extent, the still high differences between individual banks in the system. These developments enabled bringing the structure of assets and sources of funding for smaller banks closer to the structure of the activities common for the overall banking system. However, smaller banks still do not create sufficiently high and stable income that would provide positive financial results and long-term prospects for survival. Hence, some of them are very likely to face the need of changing the business model or the operating strategy. Foreign shareholders are predominant in the ownership structure of banks (in 2014 this share was 76.2%). Seven Macedonian banks are subsidiaries of foreign banks, five of which are based in the Euro area (market share of subsidiaries of foreign banks based in the Euro area is 50.6%). Analyzed by country of origin of the foreign bank, the highest is the market share of the Macedonian banks owned by banks based in Greece. Although this neighboring country is facing severe debt crisis and banks there face problems and significant outflows of deposits, it did not affect the stability of the Macedonian banks, which are separate and independent legal entities established in the Republic of Macedonia, with their own capital and management bodies.